Hello hello, friends! Look at me getting up this Candidly Kristen post before May is over! May has been another busy month in my life, so it’s nice to sit down and reflect on just how much happened. Before I start recapping May, I’ll link my Candidly Kristen monthly posts from April, March, and February if you’d like to see everything that’s been happening, behind the screen! I’m so glad to hear how much my readers (you!) have been enjoying these candid posts! They’re relaxing and refreshing to write and totally-real in true Kristen Shane style. So, grab a cup of coffee or a sweet tea and let’s talk about May 2018! The spring semester ended the first week of May, wrapping up my fourth (out of five) semesters of my undergrad! This past semester was a tough one. It was a struggle to balance everything and still get the grades I wanted, but it all worked out in the end, which I’m thankful for! I have an sister two years older than me, and she just graduated with her bachelor’s degree from Clemson University! My family and I made the trip up to SC and stayed with my family for the weekend. Both my parents attended Clemson and we have lots of family in that area, so it was great to see them all and to support Kelly! One thing ends just in time for the next! I’ll be applying to law school this fall, which means it’s the season of LSAT studying. I started studying after my finals, which has been a difficult transition. Between my LSAT prep books and reading-for-fun, I’ve basically had some type of book in my hand all month. Check out my page of 2018 Reads to see just how many books I read this month! From what I mentioned in my Candidly April post, I did accomplish just about everything! I’ve been reflecting and writing a lot (of things that haven’t ended up on my blog) more this month. I did read a lot and start studying like I hoped to do, but I don’t think life will ever slow down as much as I’d like. For Memorial Day weekend, my family and I headed to Orlando! We’re lucky to live close to Orlando, so it’s the perfect weekend getaway. My younger brother and I went to Hollywood Studios on Friday night (which I’d only been to once before, when I was much younger) and Magic Kingdom on Saturday. The resort we stayed at was beautiful, and my sweet momma took some blog pictures for me, so you can expect a post with those soon! 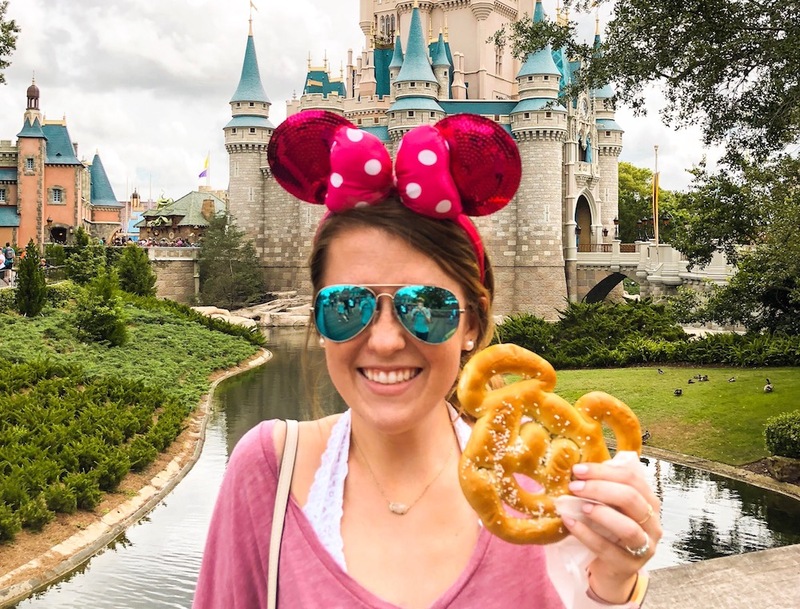 Totally candidly, soft pretzels are one of my favorite foods, and the Mickey pretzels at Disney are the best, hands-down. I’m all about the sweet little things in life, and this was one of them. Between this pretzel and the Little Mermaid ride, it was pretty much the perfect Saturday. My stress has decreased substantially with the semester wrapping up, but leave it to me to find the next thing to worry about! This summer hasn’t exactly been a true ‘break’ just yet, but I’m hopeful for the great things the rest of the summer has in store. My prayer life hasn’t been as rich this month, and I know improvement there will drastically help my overall contentment, as it always does! Like I mentioned, I wrote a lot this month, but I spent a lot less time writing blog posts. I’ve been journaling a lot more and trying to write something every single day! Today, I changed my Instagram handle from @kristenshaneblog to @kristenshane_ . I know that’s not super significant, but I wanted to mention it in case you try to follow me or search! I’ve been more active on my Twitter this month, and now those two handles match. I originally created my blog Instagram to directly support my blog, but now that I use it so much and for so much more than just my blog (like sharing prayers, books, random updates, photography, and more candid honesty), it feels fitting to simplify my name there. I think that’s all for now! Thank you so much for reading. This blog has become such a huge part of my life and heart, so I’m honored that you chose to be a part of it. Best wishes for June, friend! !